So after multiple years of Monroe Bikeway planning, traffic studies, traffic modeling, presentations to planning groups/planning group subcommittees/maintenance assessment districts/community councils, modifications to those presentations, more modifications to those presentations, and votes against other bikeways because of Monroe Bikeway—what did Ken-Tal planning group do? They prepared to vote against the Monroe Bikeway. The overriding issue that long predates this project is auto congestion on Monroe during rush hour. While Ken-Tal and the City have implemented many attempts to address this issue, the entire community has never been satisfied. The city tried stop signs in 2013, left turn restrictions from 47th to Monroe in 2015, and Ken-Tal floated closing 47th at Monroe and a traffic island that restricted turns. 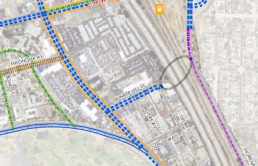 Ken-Tal has also voted to widen El Cajon Boulevard at Fairmont, directly contradicting the city’s safety efforts on this deadly street for pedestrians. 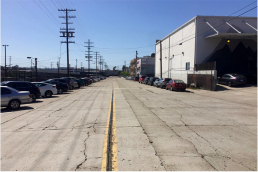 These actions have exposed a bitter community divide over a basic equity issue: Should auto access to one of the most heavily-used two-lane roads in the city be limited to wealthier north Talmadge residents, or do lower income residents in south Talmadge and City Heights have a right to this public road too? The City of San Diego answered this question by instructing SANDAG to design the bikeway without altering access to Monroe from 47th. 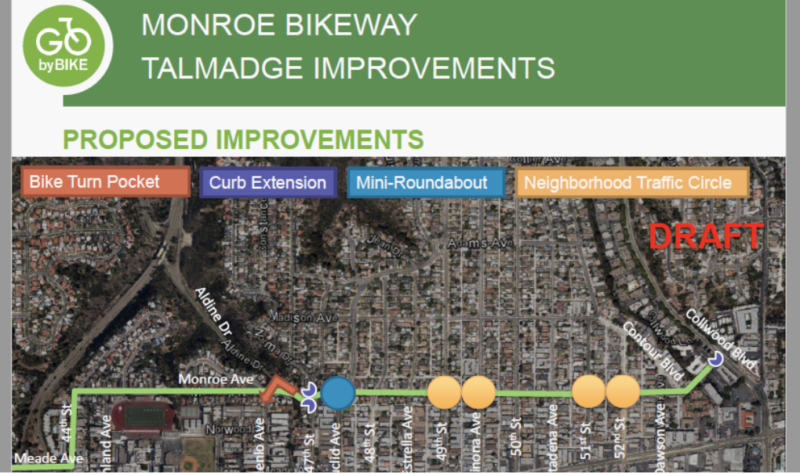 Despite Ken-Tal chair Don Taylor’s reminders that congestion issues are well beyond the scope and budget of the bikeway, Talmadge residents and board members continue to hold the Monroe Bikeway project hostage over this neighborhood dispute. In 2017, SANDAG staff was prepared to move the project forward for environmental clearance but delayed the project for 1 year to appease Ken-Tal’s concerns. As Ken-Tal requested, a HAWK beacon was replaced with a bicycle only left turn pocket in the most recent design. Despite this concession, many board members still refused to support the project. Remarkably, former Ken-Tal chair David Moty removed his support as a result of this concession. When community members oppose a project for reasons that directly contradict each other, how is SANDAG ever expected to achieve the elusive “consensus” required for bike lane projects that is not required for freeway widenings and road expansions? This is the main reason why nearly every SANDAG bike lane project is behind schedule: attempting to appease armchair engineer residents who write 62-page manifestos demanding the city subsidize his lack of off-street parking, or Ken-Tal board members who attack the Monroe Bikeway for failing to improve safety—while offering no viable alternative. 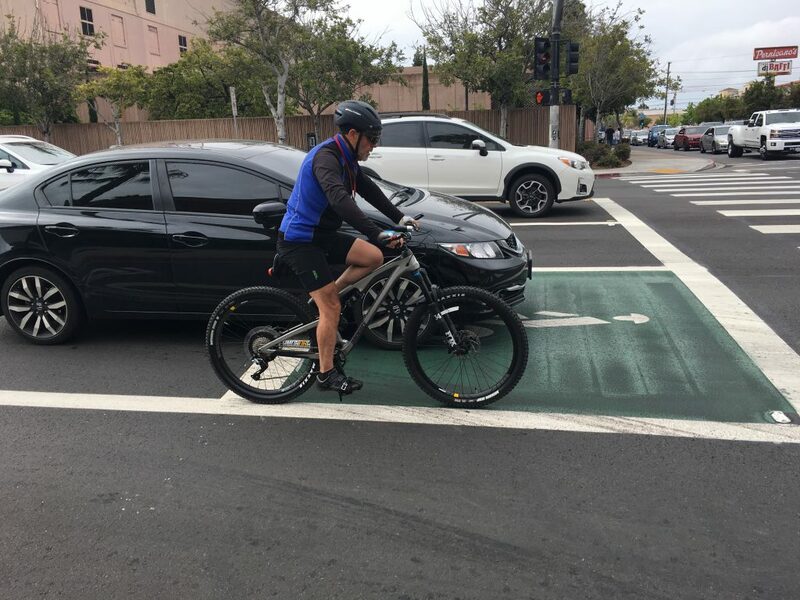 A Talmadge attorney even insisted the California Environmental Quality Act prohibits the bike lane—despite the governor signing two laws that prevent this environmental policy from being perverted to kill bike lanes. 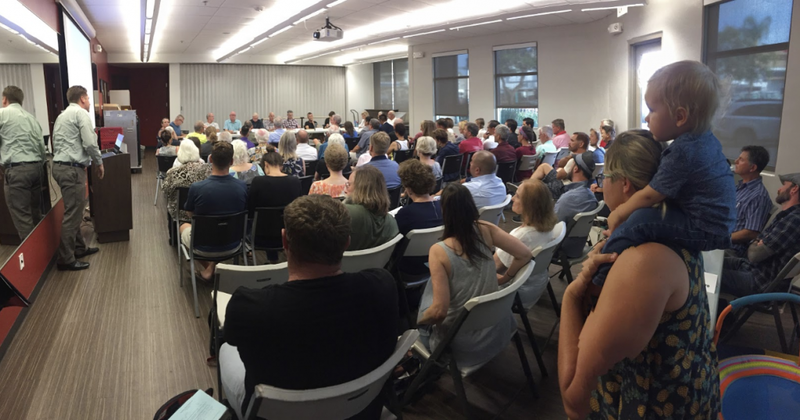 As Ken-Tal prepared to vote “no” on the Bikeway (with chair Taylor, Transportation Subcommittee chair Sean Harrison and Deborah Sharpe the only apparent “yes” votes), District 9 City Councilmember Georgette Gomez asked the board to postpone their vote. Gomez was present for the full 2 hours of contentious debate about the Bikeway and does not support 24-hour left turn restrictions onto Aldine from Monroe. She promised to take the feedback from the community planned to work with SANDAG and City of San Diego staff. Councilmember Gomez has been vocal supporter of active transportation in her role on SANDAG’s Transportation Committee and BikeSD is hopeful her leadership will result in a high-quality Monroe Bikeway. Yet so far Ken-Tal’s efforts to delay the Monroe Bikeway have been successful. As we’ve seen with the Uptown Bikeway and in communities across the country, this is a proven model to continually delay and water down bike lanes, until eventually killing them. If San Diego is going to implement any of SANDAG’s bicycle projects, city leaders must not give into “advisory” planning groups, who actually hold a powerful veto over bike infrastructure. Further, Ken-Tal’s long history of placing its own interests over the larger Mid-City community (attempting to move planned retail away from El Cajon Boulevard; voting to worsen pedestrian safety on ECB) is another reason why planning groups should be consolidated—at a minimum. For supporters of the bikeway, the next big timeline will be a CEQA exemption hearing. Prior to the recent Ken-Tal planning meeting, SANDAG planned for a September hearing. Any delay will add to concerning pattern of City of San Diego and SANDAG tolerating delays to SANDAG’s early action bicycle plan. This post is the first in a series of posts that will explain and illustrate bicycle infrastructure designs. These are the designs we want to see on our streets. These are designs that provide solutions for rider safety and comfort. All of the infrastructure featured is from the NACTO Urban Bikeway Design Guide which “is based on the experience of the best cycling cities in the world.” And here at BikeSD we want San Diego to be one of the best cycling cities in the world! So let’s start with BIKE BOX. What is a bike box? If you google bike box, you will see a shipping box, but that is not what we are talking about. A bike box is a designated area (generally painted green) at the head of a traffic lane at a signalized intersection (an intersection with a stop light or traffic light.) It provides bicyclists with a safe and visible way to get ahead of a line of traffic during the red signal phase (when the light is red.) Nearly all the benefits of a bike box are related to increased safety for riders. But, there are some benefits to motorized vehicles that come from using bike boxes. A bike box increases VISIBILITY of people riding bicycles. There are things that riders do to make themselves visible such as wearing bright clothing and using flashing lights. Being visible is key to bicycling safety. A bike box on the street helps bicycles be more visible at intersections. The bright green painted box highlights a location and motorists can expect to see someone on a bicycle in that location. A bike box decreases the chance of a RIGHT HOOK which is a leading cause of both car vs bicycle and car vs pedestrian crashes. A right hook dangerous crash that involves a vehicle turning right into the path of a pedestrian or a bicycle going straight. Bike boxes can help prevent this kind of crash because the bicycle rider is positioned at the front of motor vehicles at the intersection. A bike box provides PRIORITY for bicyclists at signalized intersections of major streets. Groups of bicyclists together can clear an intersection quickly, minimizing impediment to transit or other traffic. 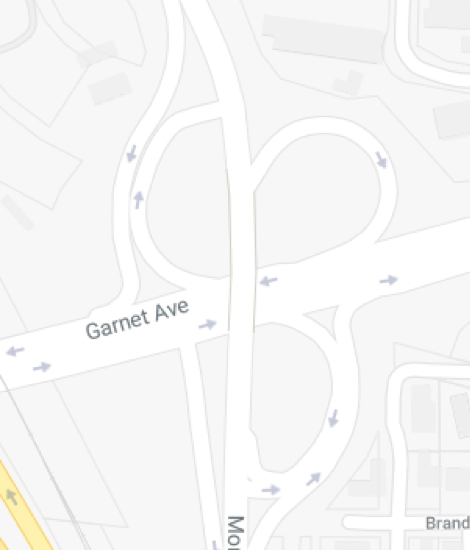 This priority has benefits for motorized vehicles because the people on bicycles in the bike box clear the intersection more quickly than a line of bicycles so right turning traffic moves through the intersection more quickly. The intersection of University Ave and 6th Ave in Hillcrest has a bike box as part of the recently painted bike lanes. Cars are supposed to stop at the edge of the box, but have not yet learned how to use the infrastructure. Some bike boxes have WAIT HERE painted at the limit line of the box. The new infrastructure on University Ave helps with comfort and safety. It is not perfect, but it is a start. Hancock Transit Corridor is envisioned as a multiple-use and mixed-use corridor connected to the Washington Street Trolley Station and the historic Mission Brewery, with a diverse mix of residential, office, and retail uses. Residential development, which can include workforce and affordable housing, will activate the area and take advantage of nearby access to trolley service. More on that below. If you don't have time to read further, we're asking you to please email this letter of support for the bike lane to your district council member. Hundreds of emails in opposition have already been sent to the City. The Loft2015 apartment building, shown below, is the first example of how this area will be transformed into a mixed-use residential neighborhood adjacent to transit. This means safely accommodating the pedestrians and bicyclists who will be living here, or using nearby transit, or just trying to get through this extremely bike-unfriendly area of San Diego. The Community Plan does propose a cycle track and multi-purpose urban trail along nearby Pacific Highway, but the city has consistently failed to build facilities that require anything more than paint - and the usual lack of funding certainly applies here. Building a cycle track along Pacific Highway would require redesigning high speed on- and off-ramps, and that's extremely costly. 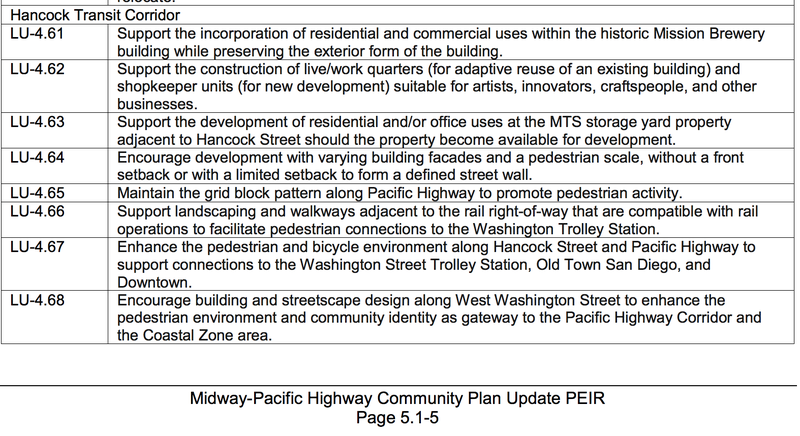 The community plan's "Proposed Policies Related to Land Use", also shown below, explicitly describes why bike lanes are planned for this segment of Hancock: to support connections from housing to nearby transit. Further, to reduce congestion and parking demand, we need to support travel modes other than just driving. Except sharrows aren't safer than dedicated bike lanes. In fact, the presence of sharrows has been shown to make streets more dangerous to bicyclists than no markings at all, since it provides a false sense of security with symbols largely ignored by drivers. During evening rush hour, Hancock becomes a dangerous alternate route to I-5 for aggressive drivers barreling down the street to the next on-ramp. Dodging speeding two-ton vehicles isn't safer for bicyclists than riding in separated bike lanes. And while the street would be narrowed under their Safeway proposal (with cars), this would also occur with bike lanes. The Hancock Street Business Association has made significant progress in removing the bike lanes from the Community Plan. Several HSBA representatives turned out to the April Midway Community Planning Board Meeting, and that board supported the businesses efforts to "explore opportunities to find more parking". In response to this, City staff reached out to HSBA to discuss options for Traffic Demand Management. Business owners were not willing to consider methods widely used to optimize existing spaces, such as timed parking and/or meters. Apparently Whalen's healthier lifestyle doesn't include biking. The Planning Commission voted to support the HSBA's request to remove the bike lanes from the Community Plan. Most recently, the City's Smart Growth and Land Use committee (Hancock Street is in committee member Lorie Zapf's district) heard this issue. New BikeSD Executive Director Judi Tentor and board member Nicole Burgess attended the meeting and spoke in support of your riding safety. Partly as a result of these efforts, the Smart Growth and Land Use committee did not support the recommendation for degrading the planned bicycle facility. Update, 06/05/2018 from City staff: The City still supports the proposed Class II bike lane, but has been requested by the Smart Growth & Land Use Committee to do further research on whether it would be possible to accommodate both the Class II bike lane and the additional parking desired by the Hancock Street businesses. Planning staff is continuing to look into this with Transportation & Storm Water Department staff. But we still believe that the proposed Class II bike lane best implements the City’s Climate Action Plan goals and best meets the needs of bicyclists in the area. This issue goes to the full City Council on June 26. BikeSD has written a letter in support of the Hancock Street Bikeway - please consider emailing this to your district council member. Can we talk about parking? Over the past decade, there have probably been at least a dozen cases in San Diego where preserving or adding street parking has neutered badly-needed bike infrastructure. 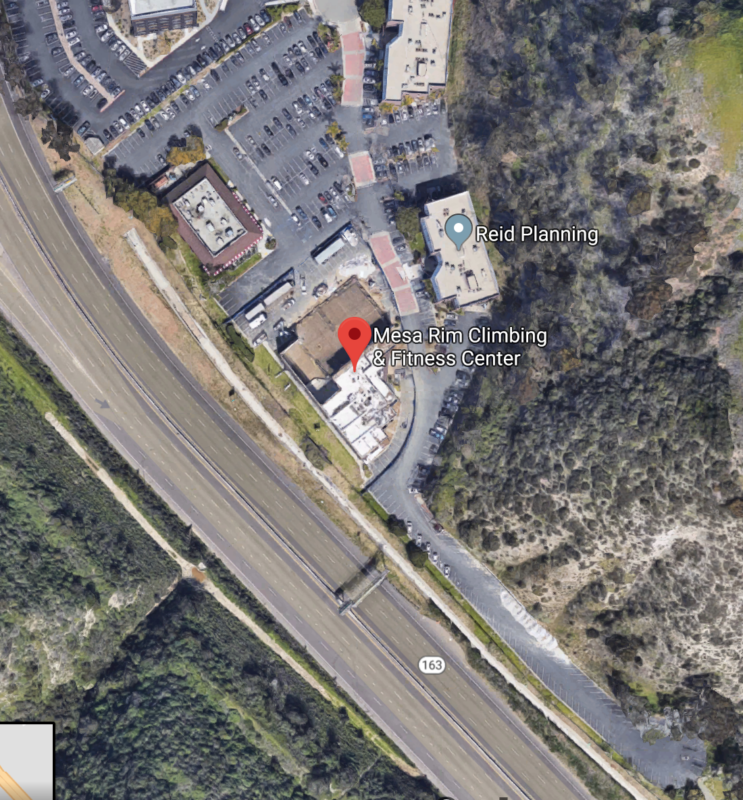 The Hancock Street Business Association responsible for this most recent example is composed of Vertical Hold Climbing Gym, Culture Shock Dance Center, San Diego Circus Center, Cali-Coast Elite Gymnastics, Bikram Yoga College, and Murphy Construction. 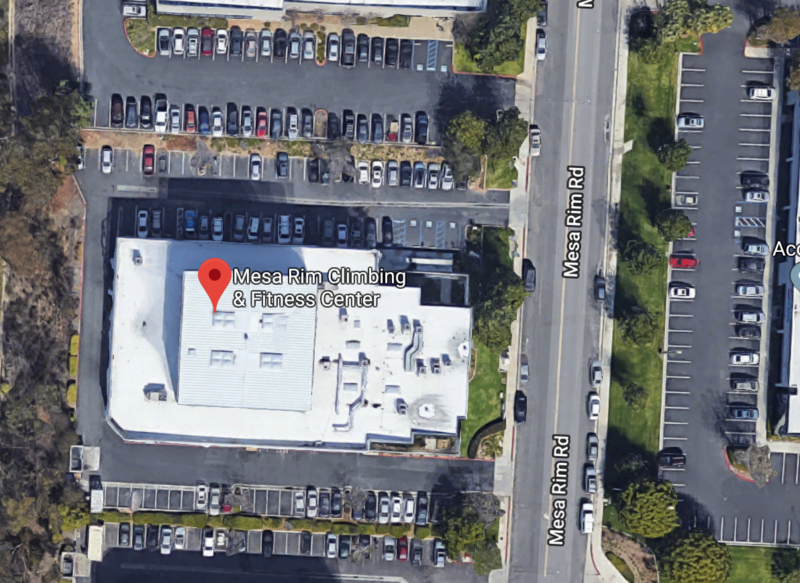 Vertical Hold has led the HSBA effort for the City to provide them with more free parking, so let's compare the off-street parking they provide versus other climbing gyms in San Diego. This lot is at least 5 times as large as Vertical Hold's, with well over 50 spaces. 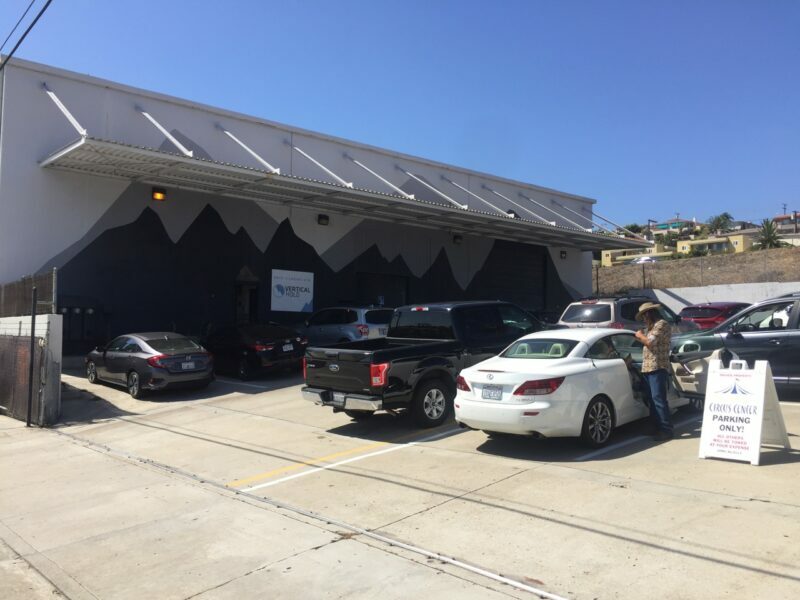 If these other indoor climbing businesses in San Diego are paying for the parking required for their customers, why is the City of San Diego required to subsidize Vertical Hold with free parking, simply because they provide inadequate off-street parking? It's unfair for bicyclists (many of whom also own vehicles and pay gax taxes) to risk their safety when they pay the same City general fund taxes as drivers that maintain our roads. Further, the City is attempting to reduce vehicle miles travelled, increase bike and public transit use and improve bike/pedestrian safety. Removing bike lanes to add more free street parking runs counter to these goals. It also sets a terrible precedent for future Community Plan Updates. 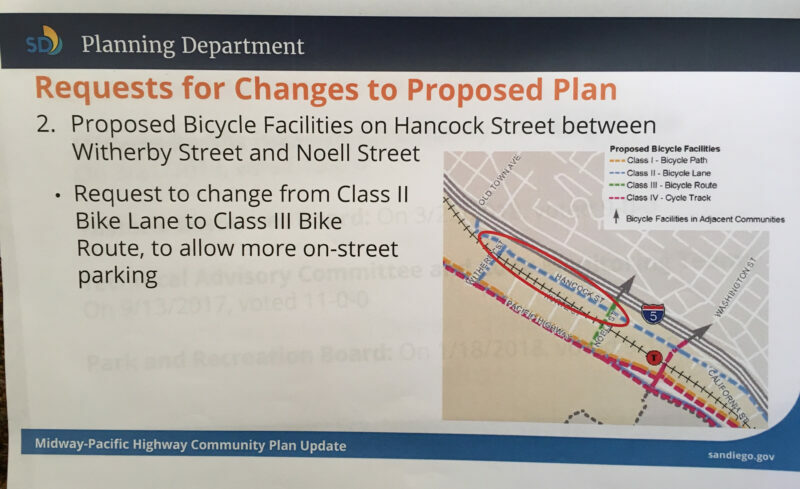 So we ask the City Council to please restore retain the Hancock Street Class II bike lanes to in the Midway-Pacific Highway Community Plan Update. Currently, the area depends on a very autocentric roadway design. 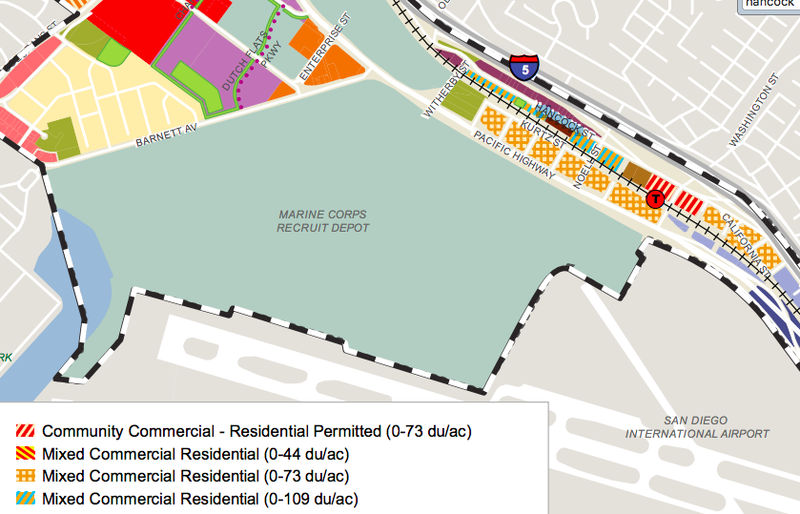 The proximity of Interstate 5 and on-ramps and off-ramps into the area bring high speed traffic directly into the plan area. The northbound I-5 exit onto Mission Bay Drive encourages drivers to maintain freeway speeds into Pacific Beach. Despite high volume of bicycle traffic, Mission Bay Drive has no bicycle lanes. Rose Creek Bicycle Path is an alternative to this high speed road but the utility of this path is constrained by a narrow path, lack of lighting and frequent homeless encampments. Despite most businesses in the area having large parking lots, Mission Bay Drive allows free street parking. 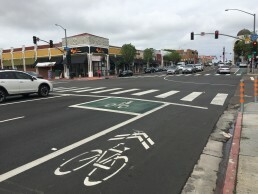 Traveling east of mission bay drive on Balboa Avenue, cyclists contend with high speed traffic, high speed interchanges with Morena Boulevard and an uphill climb into the Clairemont neighborhood. In short, the current conditions need improvement and are a barrier to area residents trying to access Mission Bay, the beach areas, and generally traversing the intersection of Balboa Avenue and I-5 / Morena Boulevard. While the draft Balboa station does not fix all of these issues, it does attempt to make improvements. For non-bicycle specific infrastructure, the plan supports the elimination of free rights and other high speed conditions in the below examples. Overall, the plan recommends a lot of improvements that will help bicyclists. As a frequent commuter through the area, I am excited about the bike lanes on Mission Bay Drive. The current state requires a bicyclist to control the lane with honking, hostile motorists. 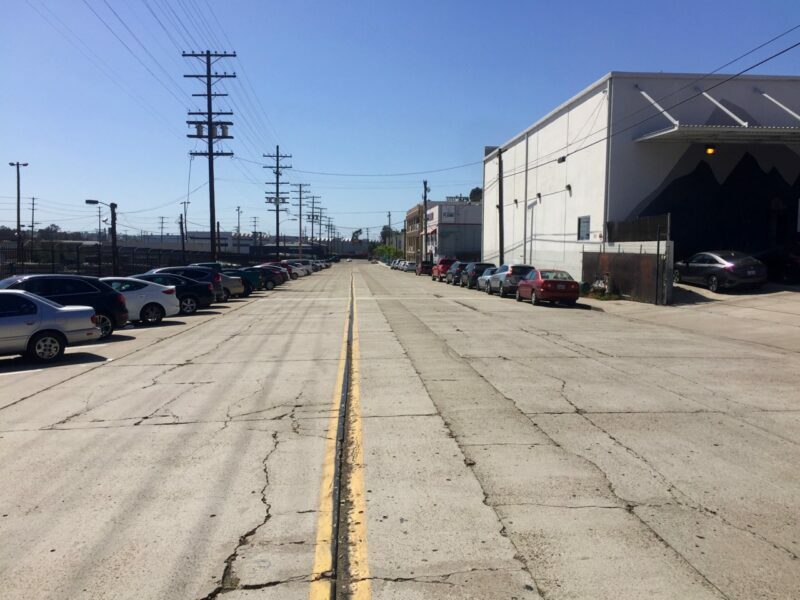 Removing some automobile parking for a bike lane is needed to create high quality, safe bike lane. 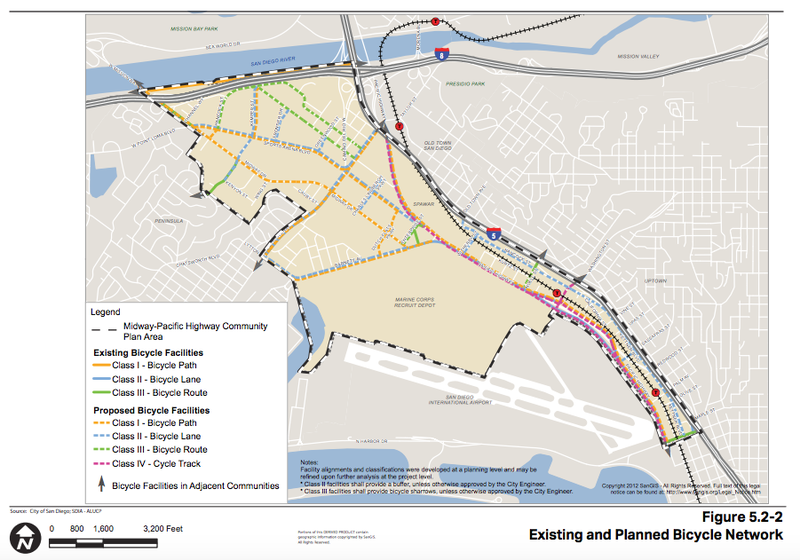 So for the bicyclist commuting north/south through the area, this plan provides improvements. However, it does not appear that this plan does anything to slow freeway traffic from I-5 as it exits from I-5 northbound. This should be corrected as it is a major hazard. A pedestrian/bicyclist bridge crossing I-5 from Bunker Hill St is proposed in the plan. 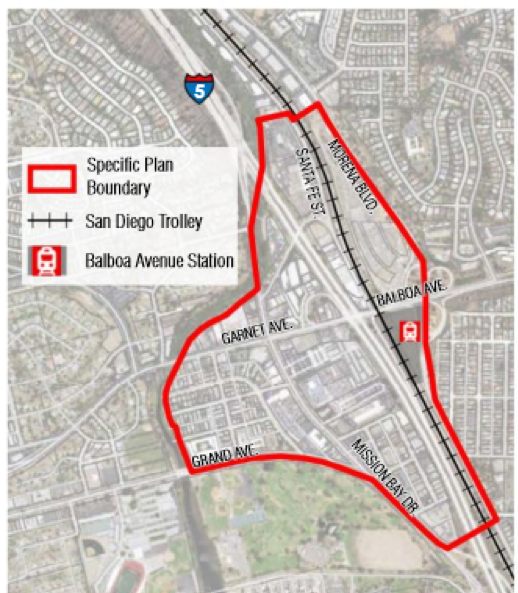 This would provide a stress-free route for bicyclists to access the trolley station. The PB planning group asked for the plan to include the pedestrian/bicycle bridge over I-5 in the earliest phase. However, a funding source and commitment needs to identified. 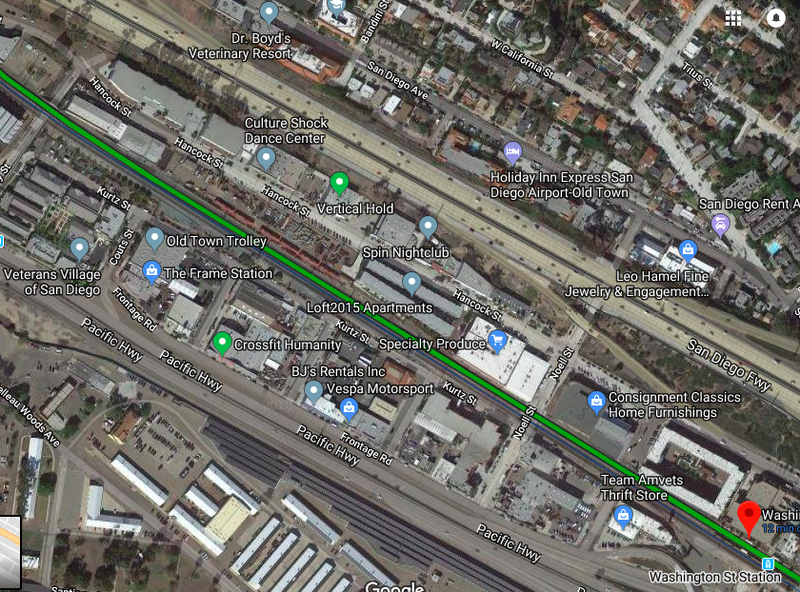 Since it helps the City of San Diego reach both Climate Action Plan goals and maximize the investment in the expanded trolley, this project should be a high priority for the city. The city is still looking for feedback on its plan. Please ask the city to prioritize safe bicycle routes (including the I-5 bridge!) in the plan. Provide feedback to city of San Diego planning department, Michael Prinz, Senior Planner, Planning Department, Mprinz@sandiego.gov. Another option to give feedback is the city provided website. As you probably suspect, not everyone wants bicycles accommodated. Don’t allow the below comment represent your views and dilute the potential great improvements that could be implemented. 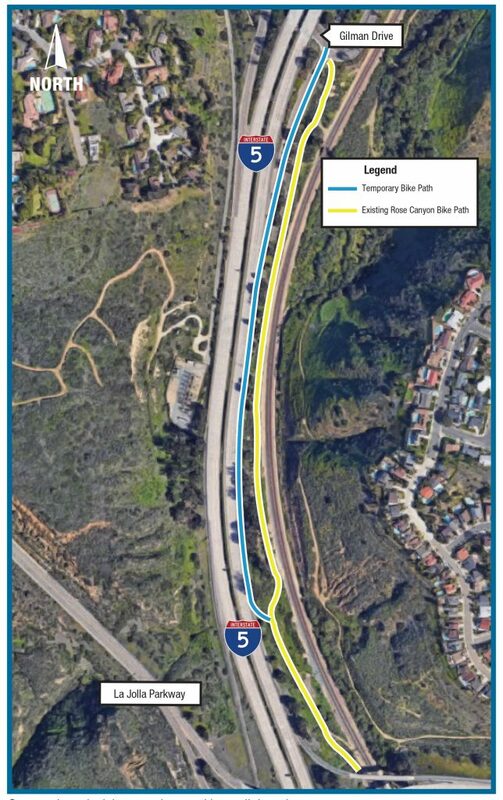 Here is an update we just received about the temporary realignment of Rose Canyon Bike Path:. The new temporary realignment of the Rose Canyon Bike Path is almost complete. Cyclists will be directed to use this new reroute beginning July 25 at approximately noon, but will still be able to access the existing path up to the point when the new path is opened for use. The new reroute will be in use through approximately November 2018. This path will reroute bicyclists from the existing Rose Canyon Bike Path west along the eastern shoulder of the northbound I-5 off-ramp. The protected, temporary two-lane bike path is constructed on the outside shoulder of the northbound I-5 off-ramp. Cyclists are required to use the temporary bike path until utility relocation near the Rose canyon Bike path is complete. Attached is a flyer with more information.